Banana Republic – Get 40% off all tops, shirts and sweaters. Online sale ends 4/19. In store sale ends 4/22. I ordered this cute cropped factory hooded jacket in XSP. See it on me here (video clip saved from my snapchat). Note: According to the website, Banana Republic Factory items can only be exchanged or returned by mail. Kate Spade – Get 25% off with code DEAREST. Sale ends 4/19 11:59 PM PT. I love this Lily Avenue Carrigan scalloped bag as recommended by StylishPetite (review here). 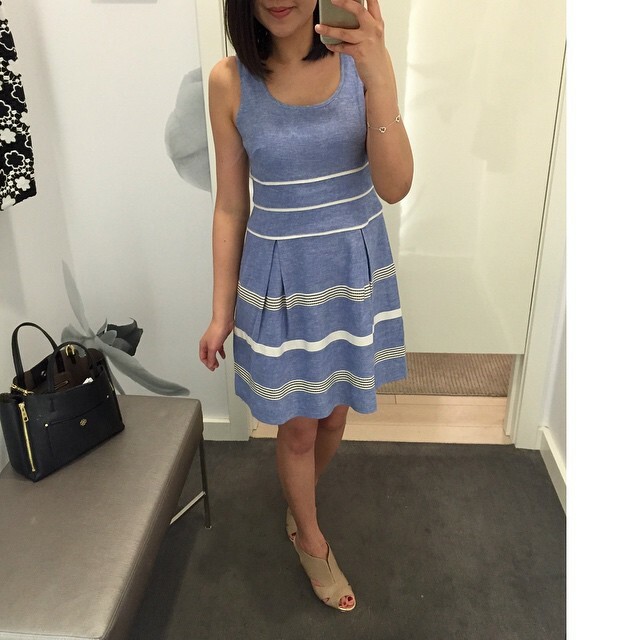 I tried on this textured stripe flare dress recently and I fell in love with it as soon as I put it on. The dress skims and flatters in all the right places and the stripe placement creates the perfect amount of interest so minimum accessories are required. I’d say that it runs one size bigger since I fit size 00P perfectly. I scored this dress for 40% off during yesterday’s sale plus and additional 10% off (total 46% off). My husband and I were in the city for dinner yesterday and it was such a nice night that we walked from his workplace to our favorite Indian restaurant and then to the local mall. Our usual lazy selves would have taken the subway or retreated home but I’m so happy to be able to wander around after a full day of sitting at work. 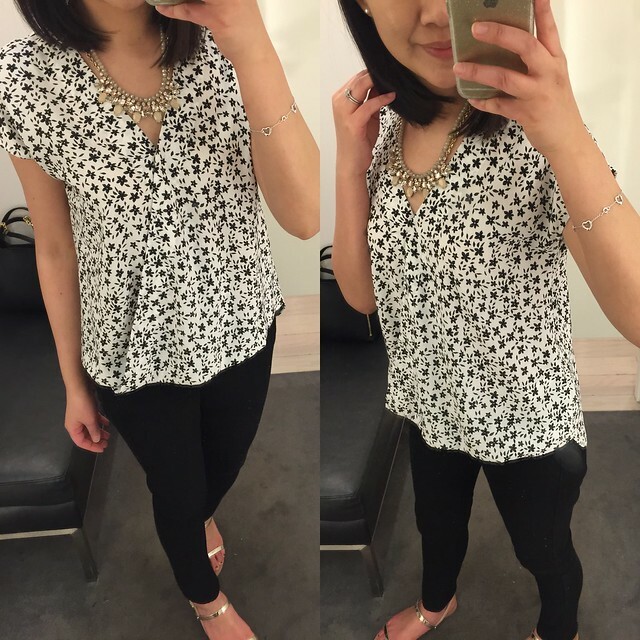 I tried on this cute daisy print crepe wrap and I’d say it runs true to size since XSP fit me perfectly. There’s a hidden snap at the v-neck but there’s a noticeable gap at the bodice when you sit down so a cami for layering purposes is a must. I tried on this ribbon stripe full skirt this past weekend in 0P but I held off on sharing it because I couldn’t find it online for my previous post. I’ve seen a few ladies buy this skirt in stores during the sale but for a pull on style skirt, I found that the stretchy thick waistband (I folded it in half below) didn’t do me any favors. 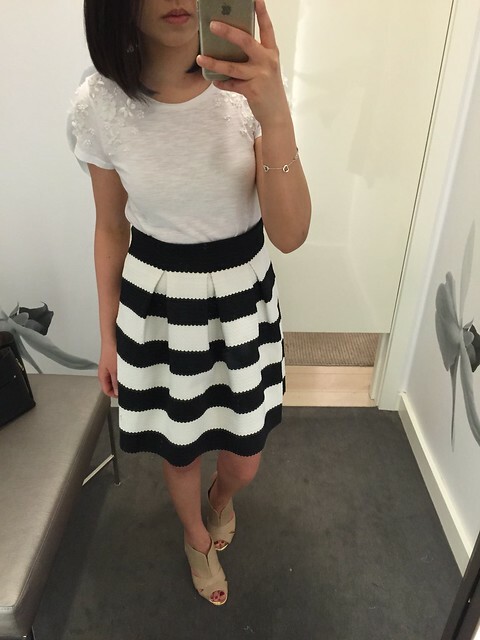 I’d say this skirt runs 1-2 sizes bigger but it’s worth trying it on in stores so you buy the right size. I spotted this bumble bee silk perfect shirt yesterday but I only grabbed 2P since I thought 0P might be too small but 2P was definitely a little loose on me. Despite the cute bee print I couldn’t get past how see through it was so I passed. You can see the outline of my bra and the extra fabric where I tried to do a half tuck. I also checked the care tag and it was 100% silk. I prefer 100% polyester so I don’t have to dry clean. 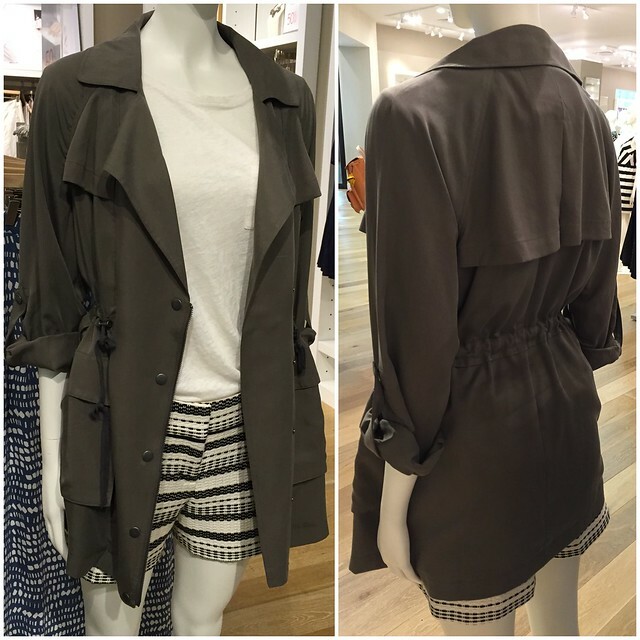 I saw this relaxed utility jacket at LOFT over a week ago but I still haven’t been able to purchase it online. 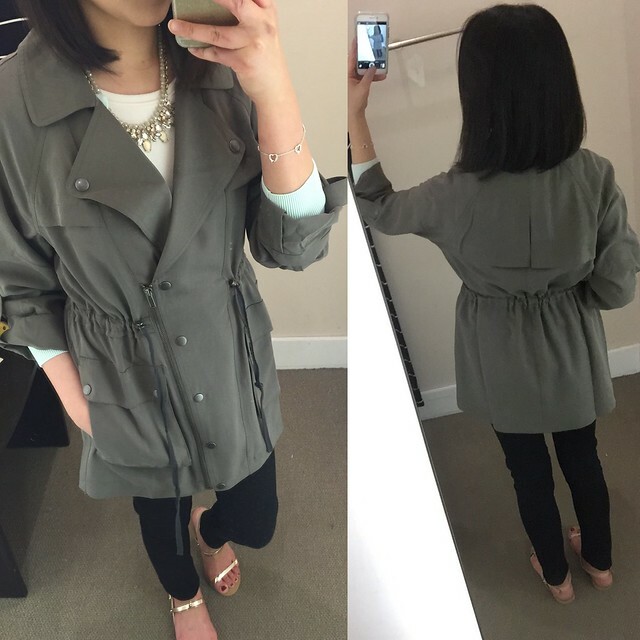 It’s really cute as a backup to my favorite Zara utility jacket which I’ve favored for years. Today I found the direct link after searching the product numbers on the tags but it’s currently marked as ‘out of stock’. I recently learned that it’s LOFT‘s method of creating a placeholder for a product before it’s available for purchase online. They did they same thing with the scalloped cropped illusion dress and banded sandals. Usually once I find the placeholder link the item is available online within a few days to a week. 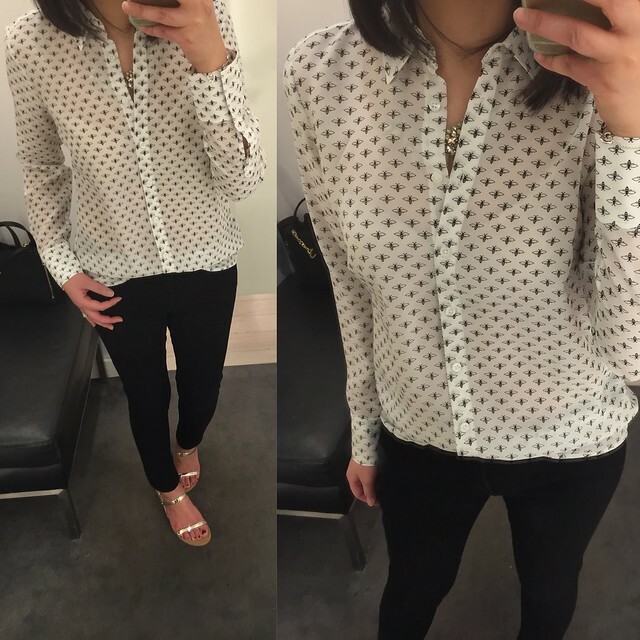 If you’re shopping in stores, I saw both regular and petite sizes available at my local LOFT and I tried on SP yesterday in store. I believe I need this jacket in XSP but that size must have been snapped up quickly by in store shoppers. 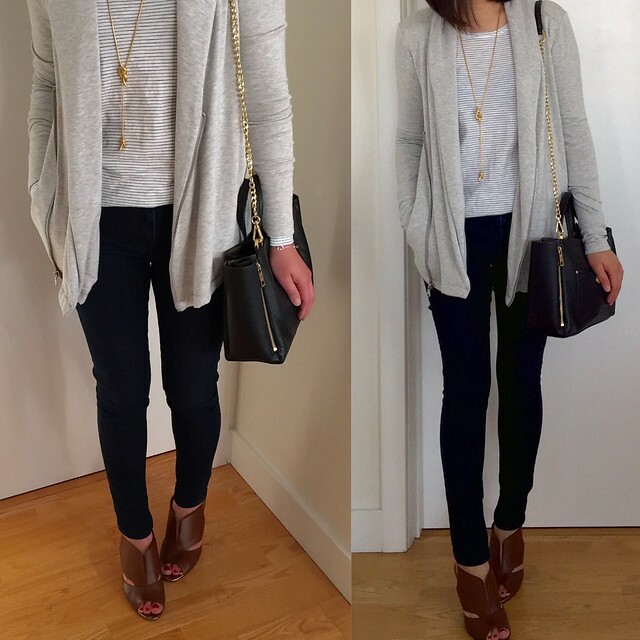 The cinching at the waist is very flattering and allows you to get your usual size or a size up without sacrificing the loose drapey fit of this jacket. I also tried on this quilted chambray shell recently since I’ve been gravitating towards blues but I didn’t get a chance to share it sooner because it was another item available in stores first. 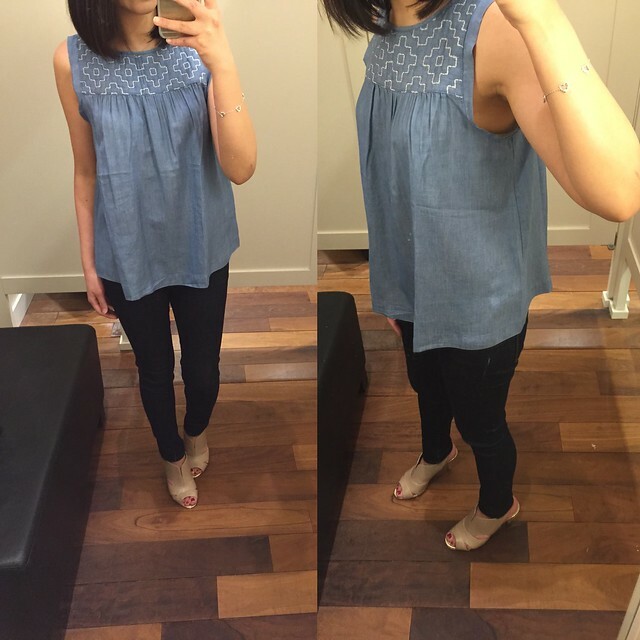 It’s made out of a very soft chambray fabric but the cut makes it look like a maternity top. It runs true to size but I found the arm holes were cut a bit too big for my preferences. I received my latest LOFT order this afternoon and it included this shadow floral shirt dress. I ordered it in 00 regular to try and it fit me loosely but it pictured well. I’d say the dress runs true to size and the regular missy size is a petite friendly length. The cute floral fabric is light but doesn’t appear to be see through and the bright yellow exposed zipper in the back is a really fun touch. I also received this beach swing dress which I ordered in XXS regular. I somehow missed the note that it’s part of their swim collection which means that it can only be returned in the mail. I ordered this dress as a filler since a friend of mine wanted the Lou & Grey marled cowl tunic which was on sale for $18 after discounts. Unfortunately, the arm holes are really big so I’d have to wear this dress with something over it like my trusty white denim jacket. Due to the tent-like fit on me I think I should return it in the mail even though I’ll be charged a return shipping fee. I’ll mull over it some more because the pink and white stripes are so sweet. Note: The beach swing dress is part of their swim collection so it can only be exchanged or returned by mail. I love this faux wrap heathered sheath dress I recently bought from Forever 21 with my store credits. I actually saw this dress some time this past winter in store and I remember trying on size M. They recently restocked it online much to my delight but it sold out quickly yet again. I took a gamble and ordered size S which fits me decently. I love the gathered detail at the waist and the dress drapes really well and looks more expensive than the price I paid. Forever 21 always has cute stuff and as I shared at the beginning of this post they’re having a sale right now so I’m tempted to order a few things. At the same time I’m afraid to place another order because it can take me many orders/months to find things that I like and that fit me well. Lastly, in addition to the epaulet cardigan I also ordered this high waist grid skirt in XSP when The Limited offered an amazing sale a few weeks ago. It arrived with some loose threads at the seams but nothing I couldn’t easily trim. I have a similar grid print dress from Banana Republic Factory so the below look is a variation of this favorite look of mine as seen here and here.